Gathering held at the Guildhall in August in support of the factory girls sculpture. 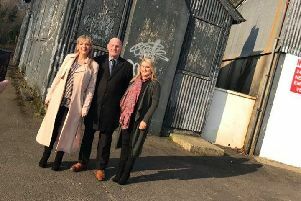 Sinn Fein MLA for Foyle, Maeve McLaughlin, has received a reply to a letter she wrote to Environment Minister, Mark H. Durkan, about a proposed sculpture to celebrate Derry’s shirt factory history. In the letter, Mr. Durkan says he is keen to work with the new Derry and Strabane district council to deliver the sculpture but as of yet he has received no planning application. “The sculpture will be a fitting historical tribute to all those women in Derry who worked in the shirt factories in very harsh conditions and for little pay. “Women were the backbone of the economy in Derry at a time when there were no jobs for local men and there was great poverty in our city. “We need to pay tribute to their contribution and to the life and history of Derry,” said Ms. McLaughlin. The Department for Social Development (DSD) has been involved in the process to deliver the sculpture. A DSD spokesperson said they are continuing to work with the artist and Derry City and Strabane District Council (DCSDC). The DSD spokesperson also pointed out that the responsibility for submitting a planning application for the sculpture lies with DCSDC. The spokesperson for DCSDC said that it is continuing to work directly with the artist and the relevant statutory bodies involved in the project. “A further update on the project is expected to come before elected members later this year,” said the spokesperson.